Once we got back from Thailand we soon got back into the routine of work. Daddy set up a new computer for the Farm and we spent a pleasant evening there getting it installed and set up. Euan ended the month with a visit to the McManus galleries in Dundee. This was with Teddy Bear Nursery, they had been studying Polar related things all month. He really enjoyed and will take Mummy and Daddy there one day! Mummy won tickets for the Caravan and Camping exhibition....but that's for next month! For more on our Thai adventures look at the photograph album. We had a little trip across to the SECCC in Glasgow at the start of the month to the Caravan and Camping Exhibition. Euan really enjoyed exploring the caravans and camper vans, the toilets were of particular fascination. It was Shetland Granny's birthday on the 9th - Euan signed his own card to send. It was also Angus's birthday on the 13th - can't believe he is now 17! Euan had a trip to RSS Discovery with Invergowrie nursery. Mummy volunteered to go along as a helper. It was very interesting and the children enjoyed themselves. I think Euan was a little disappointed not to meet Captain Scott. Shrove Tuesday saw Euan have an overdose of pancakes. Karen had them tossing some with toy pans in the morning, then he had more as a snack at nursery in the afternoon. At the end of the month, Barnaby Bear, from Invergowrie nursery came home for a sleepover. Euan looked after him very well and took several photos of his visit. March has been quite a busy month. 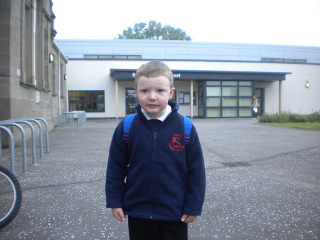 Euan has had a few of his nursery friends,birthday parties to attend at Invergowrie. He was a little overawed by them at first but was soon joining in with the best of them. Euan and Mummy headed off to Cornwall (via Belford) to visit Auntie Margaret and Uncle Richard. It was great fun. The weather was good (Euan was naked on St Ives beach...Auntie Margaret was still wrapped up in two layers of clothing!!). We managed to fit in a vist to the Eden Project, Trevarno and Lanhydrock, as well as whizzing around on the bicycle Auntie Margaret has bought for small boys to play on. Daddy even remember to collect us from the airport...again via Belford. The weather was lovely and springlike for a few days and we are delighted that the frogs have returned to our garden...awaiting frog spawn and tadpoles shortly. March ended with a 'clan gathering' and ceilidh in Cardenden. A great night was had by all and Euan looked the part in his kilt. April was a very sad month for us, as Belford Granny passed away peacefully on the 30th. It was a tremendous shock to us all and we all miss her. Following on from his cycling activities in Cornwall, Euan became the proud owner of a new bike (with pedals this time). He is having great fun with it; terrifying the life out of his parents by going at high speed! Daddy is subtly raising the stabiliser wheels... Hopefully it won't be too long before Euan had got his balance and is off on two wheels. April is of course Links Market time, so we made a trip to the farm so that the thrillseekers in the family could go. (Daddy and Auntie Rosemary were quite happy to stay behind at the farm) Everyone else really enjoyed themselves although Euan was a little disappointed that he wasn't quite tall enough for some of the scarier rides...maybe next year! When it was dry enough we managed to get a few seeds planted in the garden although it has been quite cold and they haven't made much of an appearance yet. Daddy has planted some tatties and Mummy has planted an assortment of other vegetables including carrots, onion and leeks. The beginning of May was marked by Belford Grannys funeral. Euan went to play with Mummys friend Linda while everyone else went to the service. Afterwards Euan came back to the house and was a little star. He enjoyed meeting many new people, especially Great Uncle Bob and Auntie Irene. Later in the month, Mummy and Daddy had to go back down to Belford, so Euan went for a sleepover at his cousins house. Great fun was had and Euan was lucky enough to go with Uncle Brodie and Auntie Rosemary on the annual 'picnic'. They also visited the birthplace of JM Barrie (author of Peter Pan) in Kirriemuir, but no-one was particularly thrilled by this National Trust property!! Euan had a sports day at Invergowrie nursery, photos included in general photo album. June saw us get away camping for the first time this year. The extra bank holiday meant we had three nights at Ardgulich farm on the shores of loch Tummel. Bunting for the tent was supplied by Karen, and Euan insisted it was put on the tent. The weather was kind to us, a bit cold overnight but dry. Euan has graduated - twice - Invergowrie nursery and Teddy Bear club nursery. He looked very smart with his mortar board and scroll. School! Yes it is getting closer. Euan has been to visit Errol Primary school for two Friday afternoons. His uniform has arrived and looks very smart. And finally Euan got to the Highland show with Mummy, Auntie Margaret and Uncle Brodie. A good day out and Euan was not troubled by the torrential showers. Despite the weather not being particularly summery, we've been making the most of July. Mummy took a few days off work, but the rain curtailed our activities...so Euan had his first visit to the cinema ...to see Ice Age 4. The popcorn was a great hit. Euan has attained his first swimming award and is so pleased with himself. We're hoping he manages to get his second quite quickly as the new lessons are at 8.30am on a Saturday morning! Euan is also doing very well with his cycling. Although the stabilisers are still on the bike, they aren't on the ground very much. We just need to get him running now and he might be a triathlete in the future!! Euan's other major achievement this month was mastering cycling on two wheels. We had a day out at Tentsmuir Forest, and whilst Euan was eating his lunch, Daddy took the stabilisers off Euan's bike. We had cycled halfway round the track before Euan realised they had gone! We popped down to the farm on a rare 'sunny' Sunday. Auntie Rosemary and Uncle Brodie treated us to a very tasty barbeque. We also got to see the turkey chicks which had just arrived. Euan wasn't too keen to hold one, he's probably just going to wait until there is some on his plate at Christmas time!! Errol Show was at the end of the month, and once again Mummy was awarded first prize for her clootie dumpling - it was rather tasty and didn't last long at home. The newly refurbished Errol Village Hall was opened this month. We went along to the official opening - Euan was delighted to find that some bouncy castles were available to play on, whilst Mummy and Daddy enjoyed the Cairn O'Mhor sparkling strawberry wine that was also available. We managed another couple of trips out cycling with Euan. He is very confident and can control his bike very well on some quite tricky forest tracks...better than Mummy?!! Euan's swimming is also progressing well - swimming on his back without a float. October marked the end of Euan's first term at school. He was ready for a holiday so we headed off to North Yorkshire to spend a few days in a forest lodge. This was really enjoyable and the hot tub on the veranda was our little bit of luxury everyday. Getting into the hot tub when it was frosty all around was quite a temperature contrast!! We managed to fit in a trip to Scarborough and Whitby... sampling ice-cream, amusement arcades and fish and chips.... As the weather was good we hired bikes and explored Cropton Forest. It was a bit of a slog but we were rewarded with out 3 miles of downhill at the end of the trip. We managed to fit in a trip to the Railway Museum at York which everyone enjoyed before meeting up with our friend's Colette and Laura for tea... A 'grand day out'!! For the second week of his holidays Euan went to Karen's where he entertained her with all his tales of school and other exploits. Soon, it was back to school and time for the Halloween festivities. Although Euan went to the Halloween disco at school, he wasn't particularly impressed! But at least we got as far as putting a costume on this year!! Lots happening in November! We headed off to the farm at the start of the month to watch the famous Cardenden fireworks display - they were great, but Euan wasn't too sure about the sparklers. It was great to catch up with Oliver, Helen and Auntie Margaret. Euan's swimming is progressing well and he had the opportunity to show off when Auntie Margaret and co came for a swim at Perth pool. Shetland Granny came to stay for the weekend. Euan really enjoyed her company and the shortbread she made. Mummy went along to Errol primary school for parent's evening. Euan is doing very well and enjoying phonics and learning to read. Miss Cameron is very pleased with his progress. The most important event of the month was Euan's 5th birthday! We had a visit to the aquarium at St Andrews followed by lunch at a chinese buffet. Euan enjoyed them both very much. A festive month! Euan went to the pantomime, with the school, to see Mother Goose. He enjoyed it but was not too sure about Diablo, the bad guy! Euan took part in the Christmas Show at school. He had the role of a 'talking shepherd' He delivered his line clearly and confidently at both performances and joined in enthusiastically with the singing. He was delighted that Karen came to see his evening performance. Euan's swimming continues to improve and he now has his second badge and certificate. He is not only delighted with this but even happier that he is now old enough to go on the flume at Perth pool. Daddy very kindly volunteered to take Euan down the slide for the first time but since then Mummy has managed to summon up enough courage to try it too! We had a lovely quiet Christmas - and all of us received some lovely presents. Euan is delighted with his train set and Daddy has now constructed a large platform for it in the loft. Mummy is not quite sure who is having the most fun with it....Daddy or Euan!! The Wallaces came to visit after Christmas and Euan had great fun showing off all of his gifts and generally being entertaining! We saw the New Year in at a ceilidh in Cardenden. Euan looked splendid in his kilt and thoroughly enjoyed himself...as well as scoffing a huge bowl of stovies. A wonderful evening and a great start to 2013. Copyright © 2012 Jolly John. All Rights Reserved. Designed by John Steven.